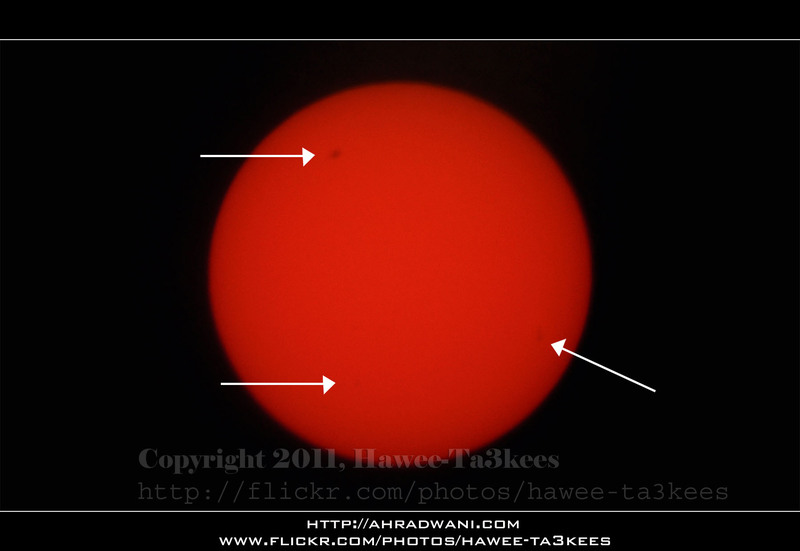 Here are three Sun-Spots i fond on the sun of the 9th of Sep. 2011 16:11pm GMT+3 QATAR Sky. I use the Nikon D90 with Sigma 50-500mm and x2 Teleconverter with Home made sun filter. See all my Sun-Sopt photos..
To be able to take a shot of the sun i create what i can call it “Sun Eclipse Lens Cover” it is very simple and easy to build it at home read the details of How to create a Sun Eclipse Lens cover on my Blog. Almost a full MooN Water Drops from the Bottle…More result..